Vernon Adams is coming for you. Beau Baldwin, Eastern Washington University's highly successful football coach, makes no apologies for demanding a great deal from his quarterbacks. "I want guys who are going to work toward being All-Americans," Baldwin says. 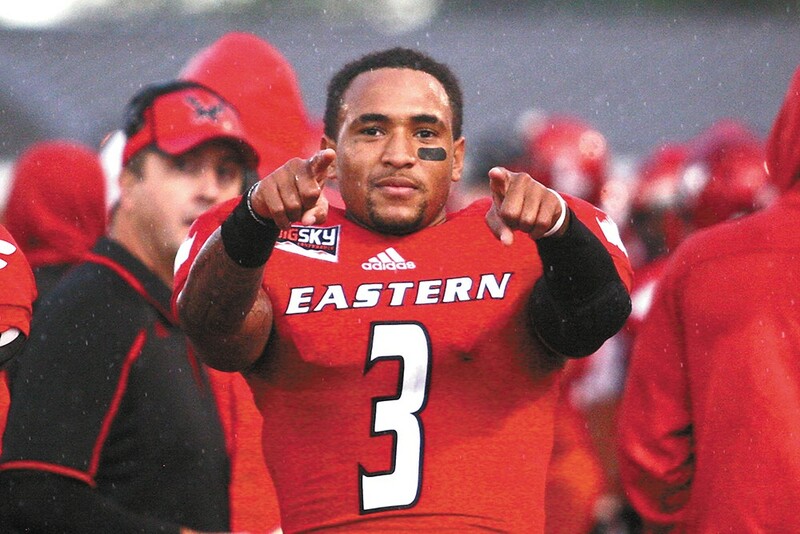 Baldwin's latest All-American-quarterback-in-waiting is Vernon Adams. The redshirt sophomore from Pasadena, Calif., has put together one of the most sensational seasons not just in school history, but in Big Sky Conference and NCAA Football Championship Subdivision history. "Vernon's season this year is the best I've seen since I've been a college football coach," says Baldwin. Adams' statistics read like something out of a fantasy league. In 12 games, he's completed 66.4 percent of his passes for 4,059 yards and 46 touchdowns. He's run for another 491 yards and four TDs, and that doesn't include the countless yards he's spent scampering behind the line of scrimmage to avoid being sacked. "It's just amazing how athletic he is and his ability to keep the play alive," Eastern guard Steven Forgette says. Forgette often can't appreciate Adams' elusiveness until he watches game film. After all, Forgette usually has his back to Adams when blocking for him. "Sometimes it's just like, 'What the heck's going on?'" Forgette jokes. "But we're all right with it. The outcome's usually good." Indeed, Adams is a leading candidate to win the Walter Payton Award as the FCS offensive player of the year. Not bad for a young man in his first season as a full-time starter. "I'm thankful and I'm blessed," the 6-foot, 190-pound Adams says. "I'm meeting great friends and great coaches. I'm enjoying college. I'm the first one to go to college in my whole family. It's an awesome experience. I love it out here." The third-ranked Eagles are 10-2 overall and won the Big Sky at 8-0. Adams has led Eastern into the national playoffs one year after splitting time at quarterback with Kyle Padron, who passed up his senior season in an unsuccessful (thus far, anyway) attempt to play pro ball. Baldwin, Forgette and Adams say hard work and dedication enabled Adams to make huge strides from a year ago. Mind you, College Sporting News tabbed Adams the FCS Freshman of the Year last season. "He was a freshman with some incredible talent," Baldwin says, "and he made a lot of plays and won a lot of games with us as a freshman. But he chose to take it to another level [this season] in terms of, 'I don't just want to be a great player, I want to be a great leader. I want to understand all the nuances of the position. I want to work the position year-round.'" Forgette says Adams' boundless energy and upbeat attitude makes him "a guy you want to be around." Adams is quick to return the compliment.